...ok so technically we didn't go all the way around the world but pretty close. And after 2 24 hour travel days which each included a 12 hour flight plus four more hours of flights it feels like we went around the world. So without further ado here is the much anticipated "China blog"
We stayed in a very nice hotel that sat right next to the main tourist area of Shanghai called Nanjing road. It was a very long street full of shops, malls, restaurants and lots and lots of people. So lets start with the people. The people are not what I expected. I was expecting a very formal and possibly overly courteous people. I was quite mistaken. It was quite informal and apparently living in a city of 13 million makes you, how do I say this nicely, fend for yourself with little regard for others. That is not to say that people weren't friendly. One on one and in small groups we met some very nice people but in large groups it is defiantly an out for oneself situation. For example we did a lot of walking and shopping. No one opened doors for another, moved to the side to let some one pass or any other basic courtesy one comes to expect in a social situation. They have very little regard for personal space. Now I know I tend to need a bit more personal space than most, but this wasn't just me being too sensitive. They really do get really close when they are talking to you or are in an elevator with you. It was quite uncomfortable at times. I admit I thought about pushing someone a time or two...but I refrained. There are no smoking laws in China. They are still allowed to smoke wherever they would like. So that was a bit of a culture shock. Especially since it seemed like every man in china smokes. No so great on the ol' asthma. The thing that sticks out the most as far as differences however is their driving. Street lights and lanes are treated more like suggestions than actual laws. You feel like you are taking your life in your hands each time you crossed a street or rode in a cab. Drivers honk and swerve and maneuver until they get where they need to be. I am amazed we didn't see a major accident while we were there. We did see one minor accident and a scooter incident that was quite humorous. Which brings me to my next observation there are just as many if not more bikes and motorized scooters as there are cars. You would see women in dresses riding a bike or a scooter. Couples, friends, kids and even dogs rode on scooters or bikes. It was a very interesting sight. I think we talked more about the traffic and the scooter/bike/car situation more than anything else while we were there. Some of the smells were awful. I just leave it at that. People would just spit or maybe more appropriately "hock a loogie" in the middle of the street or side walk where ever they happened to be. It was a bit disturbing to see old women do this. I guess because the air is so polluted this is not considered rude...pollution or no I still thought it was nasty. Almost every time you saw a pair of women walking together, which was often, they had their arms linked or were holding hands. Again with the personal space infringement. This brings me to fashion, how I am not sure but just go with it. The men were, well, men and mostly dressed like any man you know...predictable. Not so with the women. They had a fairly American based fashion but with their own twist. For the most part I really liked what I saw. There was very little jeans and a t-shirt sort of outfits. Which made me feel under dressed most days since jeans and a t-shirt is my usual uniform. They seemed to dress up and accessorize more. I think because it is a major metropolitan area people just dressed up a bit more. And boy do they love their shoes. I think I saw 2 pairs of sneakers the whole time. Most of the time they wore nice shoes, even they crossing guard we thought was a man was wearing hills. So either she was a bit masculine or he was a bit feminine. Either way cute shoes. What was really weird though is there relationship with socks. Here are just a few of the weird ways they wore their socks: nylons (not tights) with short shorts, so short in fact that you can see the line at the top of the pantyhose leg; knee high nylons with bottoms that do not cover the top of the knee highs, again we are not talking tights here we are talking 'no one is supposed to know you are wearing knee high nylons' nylons; another favorite of mine was the ankle nylon(which I did not realize existed) with pants that do not cover the top of the socks...there is a severe misunderstanding about nylons and their proper usage. Then there wwere the people we saw in pajamas. A big part of shopping in China is bartering. Ben and I really enjoyed this part. There are regular department stores where the prices are set like here, but there are also touristy areas where you bartered for goods, we got quite good at it. The secret is to be willing to walk away. There were very few times when we didn't get the price we wanted. Space is limited in Shanghai. There is no single family housing, it is all apartments and condos. Many buildings have a very small footprint but are many stories high. This includes malls. It was very typical for a mall to have many small levels. And the stores are set up differently too. Depending on the place they are either tiny little cramped shops or they all kind of blend together. And you can't just pick something out and take it to a register. You have to show them what you want, then they write it down, you take the piece of paper and your money to a cashier who gives you another slip of paper to take back to the person you started with, who will then give you what you bought...figure that one out. The food was for the most part really good. But there were some things that were just yucky. For example our first dinner included what can only be described as tomato jello, complete with seeds. Anyone who knows me well knows I don't do jello, veggie flavored jello took that dislike to a whole new level. Just in case you are wondering, yes I did try it and I threw up a little in my mouth! Don't worry it was totally sly. So if you made it this far I am impressed you are either really bored, avoiding something more productive or you just really love me...my bet is on the first two. Have the cranberries ever caught your eye as you wondered through the produce isle? Have you wondered what one might so with fresh cranberries besides cranberry sauce at thanksgiving and garland at Christmas? Well my friends I took the leap and bought fresh cranberries, honestly having no idea what I was going to do with them once I got home. 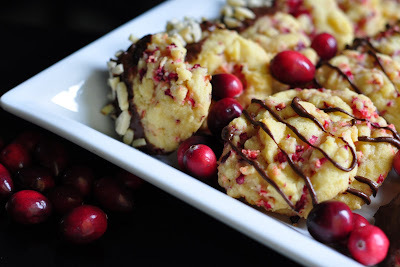 Through the miracle that is the internet I found that there are a lot of things you can make with fresh cranberries that do not involve a major holiday. I actually wanted my family to eat what I made so I decided on cookies. 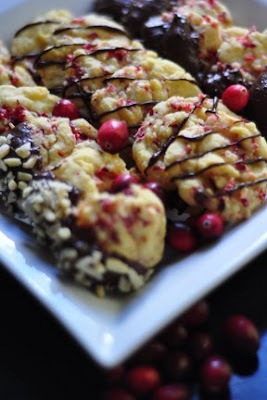 Now I understand many people do not like cranberries, to those people I say first come on give it a try and second you will after you try these cookies. I am not going to lie I love cranberries so I was pretty sure I would love anything made from cranberries, but these are amazing. They are a great combination of tart and sweet. I did change a couple of things from the original recipe...nothing crazy but a few things. First I used the food processor to chop the cranberries, I knew big chunks wouldn't fly at my house (that sounded way grosser than I intended). Second I only dipped about 1/3 of the cookies into nuts, my family also not into nuts. Third I decided I didn't love the look or the taste of the cookies dipped half in chocolate...the chocolate was over powering and detracted from the cookie (I never thought I would hear myself say that chocolate detracted from anything). 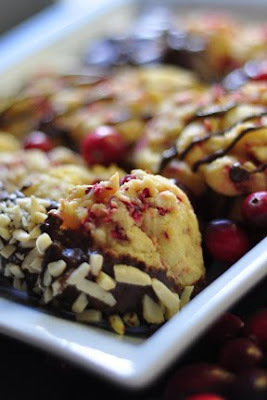 So I piped chocolate over the cookies in small lines which I liked much better. Oh and just for the record I used milk chocolate instead of semi-sweet. Next time I make these I think I will add some orange zest and maybe try dark chocolate. I know what you are thinking "But Terrie shouldn't you be getting ready for your trip to China and not spending all morning making cookies, photographing said cookies and then blogging about the cookies." To answer your puzzled looks ABSOLUTELY, I should be getting ready for China. But this was way more fun. And I might have gotten a new lens that I wanted to try out...maybe.